Location: Central French Alps. The climb starts just outside Bourg d'Oisans. Because of differences in where timers have started the clock (some writers call it a 14.5 km climb), there is no small amount of disagreement as to the fastest ascent. Marco Pantani is generally credited with the best time at 36 minutes 50 seconds. 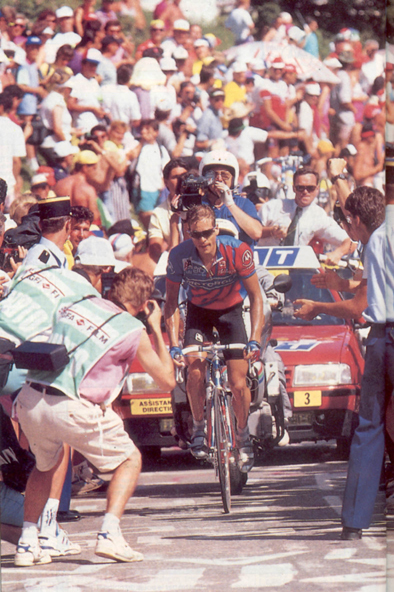 Prior to the use of EPO in the early 1990s, the best riders generally took more than 40 minutes. Coppi's 1952 time is given as 45 minutes 22 seconds. Switchback seven is known as the Dutch or Orange Curve because it's where Dutch fans congregate. Each of L'Alpe d'Huez's 21 numbered switchbacks (number 21 is at the bottom) is named after a rider. Number 21 is Fausto Coppi, 20 is Joop Zoetemelk's and Number 1 is Giuseppe Guerini. Journalist Jean-Paul Vespini writes that when the Alpe is included in the Tour it is decisive. Not that the stage winner wins the Tour, but that in the great majority of cases, the winner of the Tour was in Yellow following the Alpe d'Huez stage. When he wrote his book The Tour is Won on the Alpe in 2008, this was true in 17 of 25 visits to Alpe d'Huez. In 1952 Alpe d'Huez was the site of the Tour de France's first hilltop finish. Back then it was, in Les Woodland's words, "no more than a primitive ski resort of three hotels at the top of a potholed road." The town's businessmen paid the Tour organization 2,000,000 francs (maybe $4,000 today) to have a stage end at the top of their mountain. The day after was a rest day, to encourage people to spend the night in the town and help defray the merchant's expenses of bringing the Tour to L'Alpe d'Huez. In June of 1952 Fausto Coppi was still in the sweet spot of his career, having just won the Giro by more than nine minutes. After stage nine of the Tour de France, Coppi was in fourth place, five minutes behind teammate Andrea Carrea. 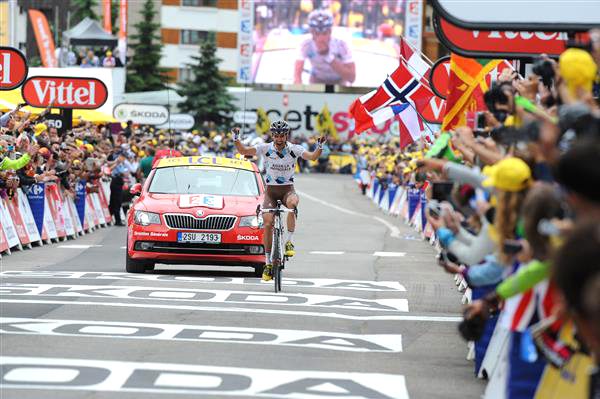 Stage 10 started in Lausanne and finished at Alpe d'Huez. On the Alpe's first switchback Jean Robic lauched a blistering attack that only Coppi could follow. 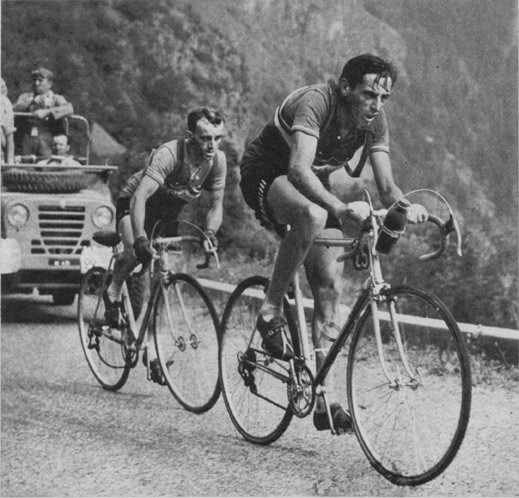 Coppi rode with the diminutive Frenchman for a few kilometers and with six kilometers to go, Coppi simply rode away. He arrived at the top 1 minute 20 seconds ahead of Robic and took the lead for good. The Tour did not return to the Alpe until 1976 when Georges Rajon, the man responsible for bringing the Tour to the mountain in 1952, again gave the organizers a box of money. Stage nine of the 1976 Tour was a success. Joop Zoetemelk and Lucien van Impe hammered away at each other all the way to the top. Zoetemelk won the stage and van Impe won the 1976 Tour de France. 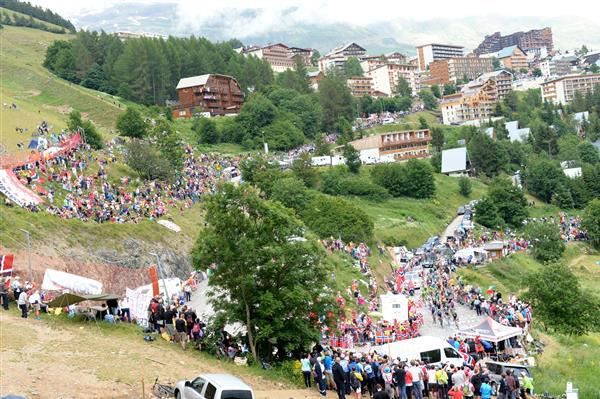 Since then, the Tour has returned to L'Alpe d'Huez regularly and it has become the race's signature climb. In 2013, in fact, the Tour went up the mountain twice during stage 18. Because Dutch and Dutch-speaking riders have had so much success on Alpe d'Huez, when the Tour visits the mountain orange-clad fans from the Netherlands turn the hillside into a giant, raucous party. "I still remember hauling some folks over to the Alpe from Briançon by special request back in 2005 when we did an Italian Alps itinerary. We climbed the Agnello followed by the Izoard and spent the night in France before heading out the next day over Montegenèvre and up to Sestriere. 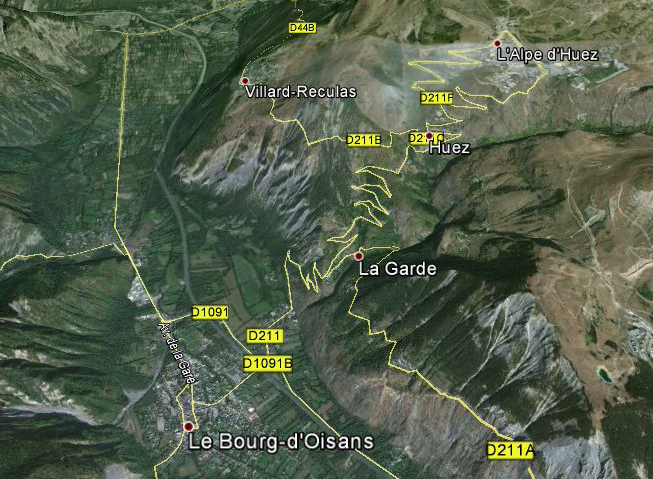 They requested an extra day be added in Briançon, solely to visit and climb the famous Alpe. "While driving them up the Lauteret, I cautioned them not to expect all the hoopla and excitement they'd seen on TV during LeTour. I went on about 'the sleepy hamlet' of Bourg d'Oisans and how the ski-related businesses atop the famous climb were pretty quiet in the summer except when Le Tour visited. "I felt foolish when we drove into 'sleepy' Bourg d'Oisans to find it packed with tourists. While far from the craziness of a Tour visit, it was just as far from my description. I could not believe how commercialized the iconic climb and its environs had become. In the mid or late '90s one was lucky to find a 'Bernard's Bike & Mower' shop there but now there was a huge operation in the center of town offering anything you could paint, screen, engrave, embroider, sublimate or otherwise put 'Alpe d'Huez' on. "Meanwhile, hundreds of cyclists of all shapes and sizes labored up the famous climb, with what seemed like an army of their friends and for-profit photographers there to capture the entire thing. The village up top was bustling too, totally different from the days we'd get up there only to find the place almost deserted. Seemed like every bike tour company I'd ever heard of had clients there too...it really was surreal to me." 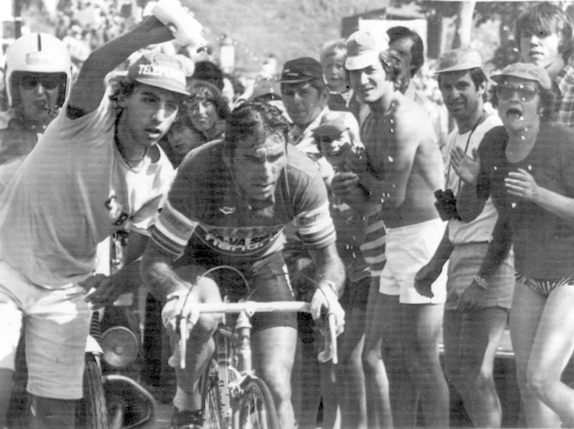 Joaquim Agostinho, winner of stage 17 of the 1979 Tour which finished at L'Alpe d'Huez. I'm not positive he's on the Alpe here (there were a few climbs before), but I think so. 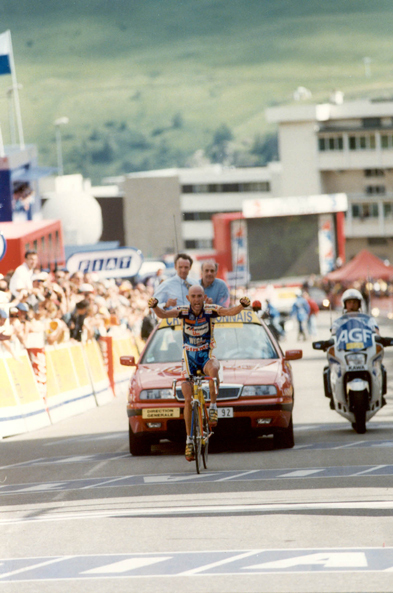 Bugno does it again at L'Alpe d'Huez. 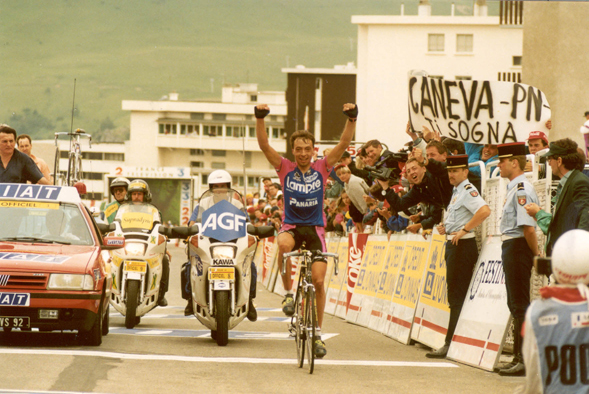 Here he beats Miguel Indurain in the 1991 Tour de France. 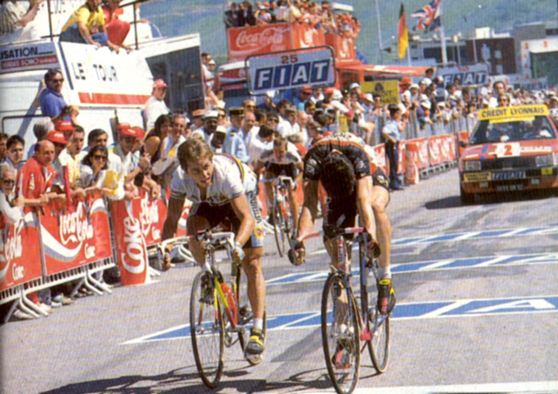 Andrew Hampsten riding up L'Alpe d'Huez to victory in stage 14 of the 1992 Tour. 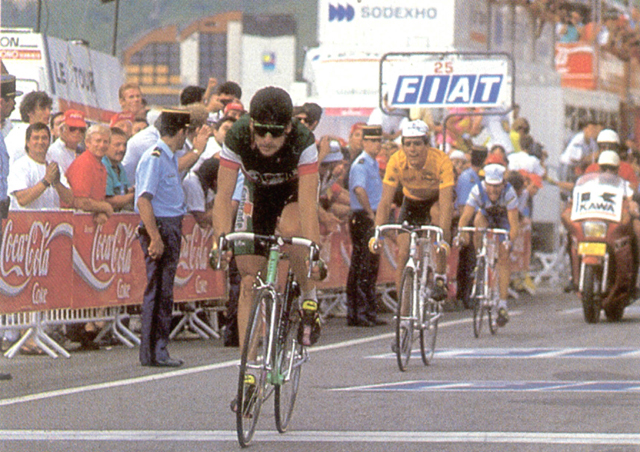 Robert Conti wins stage 16 in the 1994 Tour. 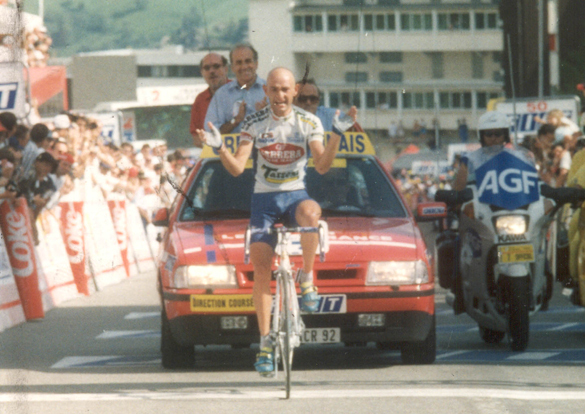 Marco Pantani is victorious in stage 10 of the 1995 Tour. Christophe Riblon wins stage 18 of the 2013 Tour.